Thanks to all of you who have followed us on this site. We are moving but please come with us! Henceforth this blog will continue on Senate House Library’s website at http://www.senatehouselibrary.ac.uk/category/historic-collections/. We hope you’ll continue to follow us there. Commissioning articles for a treasures volume is an uneven experience. Some people accept an invitation immediately, while other books are hawked around for up to five times or so before a scholar agrees to write about them. A few people responded to the invitation with the query: “Why don’t you write this piece yourself?”, and sometimes, as emails flew to and fro and I wielded the editorial red pencil, I did wonder whether it would have been simpler to have been a single author than an editor. But the quality of the finished product would have suffered. As it was, a stellar team of contributors demonstrated the fact of institutional goodwill, as sixty busy people, not all of whom were connected with the University, took time to research and write 400-word entries. Not only that, but contributors came with new angles and with expertise in their areas. Myths which had lasted half a century or longer were debunked and new discoveries made. Some were disappointing: a unique incunable is more prestigious than one of two copies (item no. 5; but at least Senate House Library continues to have the only known complete copy in the world. The second copy, long in the Sorbonne, had initially been incorrectly identified). 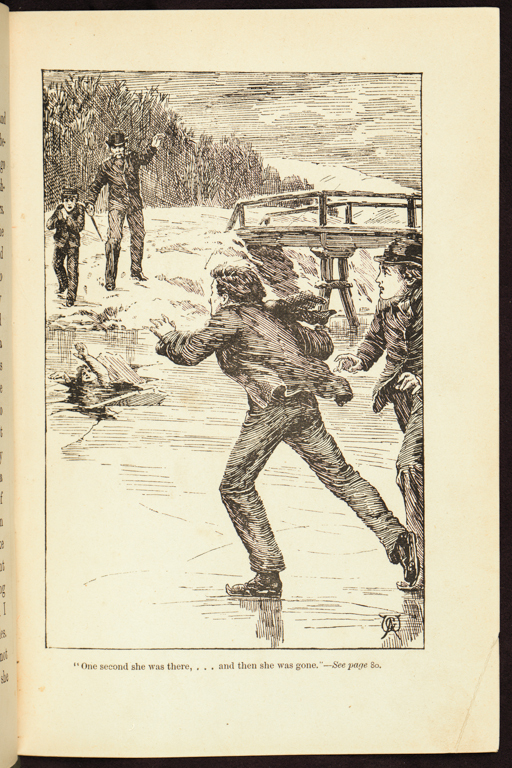 Others were exciting, adding nuggets of research to a coffee-table volume: for example, Brian Alderson, editor and translator of many children’s books, identified the anonymous illustrator of a scarce Victorian children’s book, Halt! Producing the treasures volume was exhilarating and worthwhile. Editress Karen Attar has now published a short article in SCONUL Focus, 58 about the benefits of producing such a volume, “Making Treasures Pay? Benefits of the Library Treasures Volume Considered”, accessible here. I first visited the Reading Room longer ago than I care to admit when I started research for a PhD dissertation, which focused on the ‘Universal English Short-hand’ invented by John Byrom (1692-1763) diarist, poet, local political activist, linguist and FRS – all in all, something of a polymath. 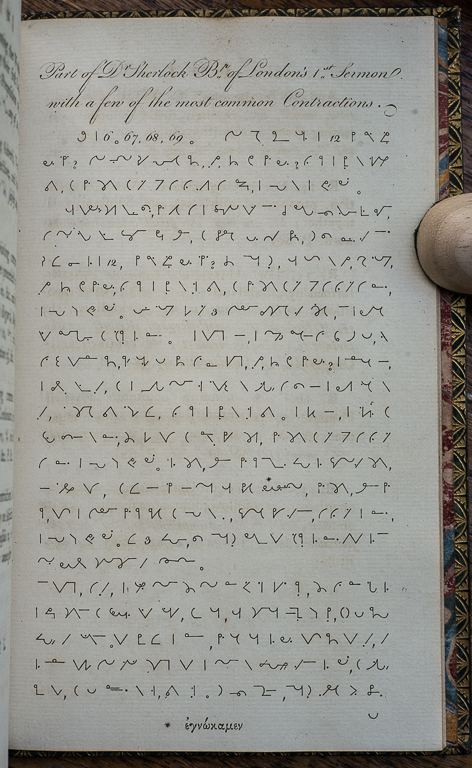 Now that I’m preparing an edition and biography of Byrom, as well as continuing my research into eighteenth-century shorthand more generally, I’ve returned to explore more of Carlton’s great collection. I’m really enjoying doing so : it’s a neglected but very rich mine with much to interest current and future researchers in a gamut of fields connected with the history of communications, education and palaeography. Byrom’s was a leading and influential early eighteenth-century shorthand, which he spent so much of his life teaching (for a princely five guinea sum) while also raising subscription support for a printed manual, published posthumously in 1767. Carlton’s collection contains extremely rare, at points unique, evidence relating to Byrom’s subscription project. As is clear from correspondence that Carlton preserved, Byrom’s manual came to be highly prized by shorthand collectors in the late nineteenth and early twentieth centuries. So Carlton must have been all the more delighted with his own acquisition of what is a splendid association copy (CSC Byrom  Box 3): this had been presented to Ralph Leycester, Squire of Toft (1699-1776), a leading proponent of Byrom’s system and a close friend for over four decades, whose own shorthand diaries I have been transcribing. Another Byrom-related treasure in the collection is a letter written by him to Fisher Littleton (MS Carlton 35/12(i)), a Fellow Commoner of Emmanuel College Cambridge, fascinating as an instance of eighteenth-century ‘teaching-by-post’ and for showing that Byrom’s shorthand continued to be promulgated at Cambridge well after Byrom started teaching it in person there. For the University of London, the classical historian George Grote was an exceedingly important figure: not merely as an authority on Greece but as an administrator and innovator, a member of the University of London Senate from 1850 onwards and Vice-Chancellor 1862-1871. He further bequeathed to the Library its second significant collection of books: about five thousand volumes on Classics, history, economics, philosophy and other matters. Thus Grote’s representation in the treasures volume was partly a celebration of corporate identity. Representation emerges here in a very personal way, in a letter about him by his fiancée, Harriet Lewin, to her sister. 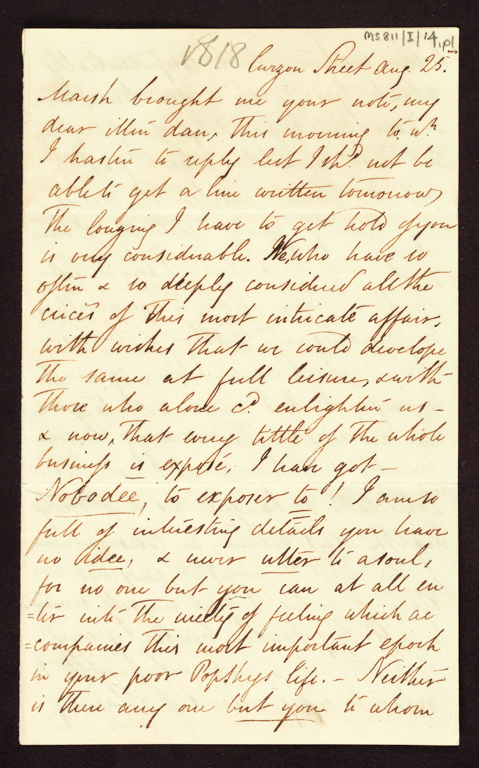 It is an atypical letter among the Lewin Papers (MS811), an archive which focuses on Harriet’s nephew Thomas Herbert Lewin (1839-1916), an administrator in India. Grote’s courtship and marriage to Harriet were problematical. The relationship began with a misunderstanding when a rival led Grote to believe that Harriet was already engaged to somebody else (see here), and continued under a cloud of parental disapproval which meant that sole contact was by correspondence. The letter is dated 25 August 1818, shortly after her engagement, and indicates something of the relief of the written word and the general lack of sympathy towards the young bride to be: “You know him, and have the capability of appreciating those qualities which ‘pass outward shew’, whilst the rest of my family judge entirely of him by exterior qualities”. Ultimately the couple married clandestinely in 1820. They were very happy, despite Harriet’s poor health and the disappointment of remaining childless. Although Harriet was unable to ensure Grote’s posterity through offspring, she compensated by becoming his first biographer (1873). Beyond martyrology, students saw examples of early printing. A copy of the encyclopaedia De Proprietatibus Rerum from approximately 1471 served multiple purposes: to show a book printed by William Caxton in Cologne before he commenced printing in England; to demonstrate the hybrid nature of early printing, with initials added in manuscript in red and blue; and to point out different perceptions of learning over time, with medicine here being viewed as belonging to the humanities. 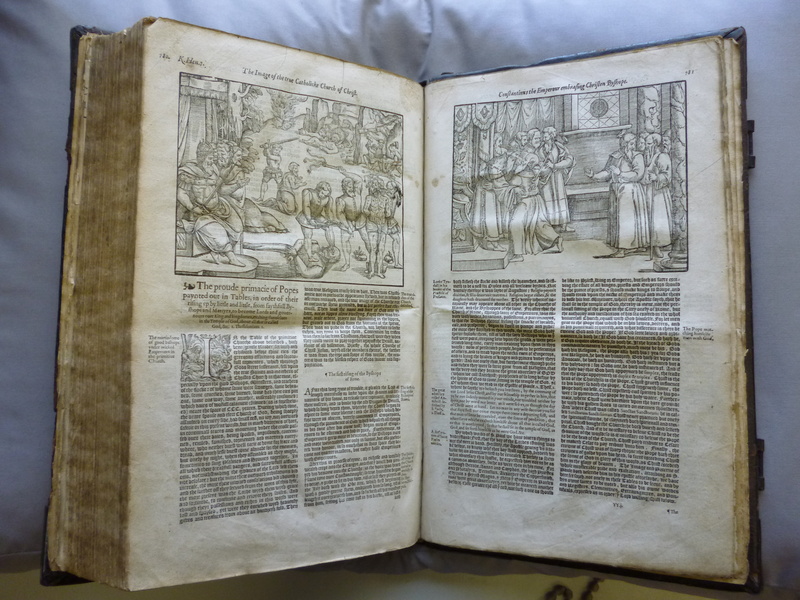 Shakespearean sources also featured, with two editions of Holinshed’s Chronicles. Attention focused on Macbeth, for which Holinshed provides the major source, and vocabulary was compared between Holinshed and the First Folio: were the three witches weird, as described by Holinshed, or were they wayward, the adjective used in the First Folio and then abandoned? The highlight for the students was indubitably the sight of Shakespeare’s First Folio. 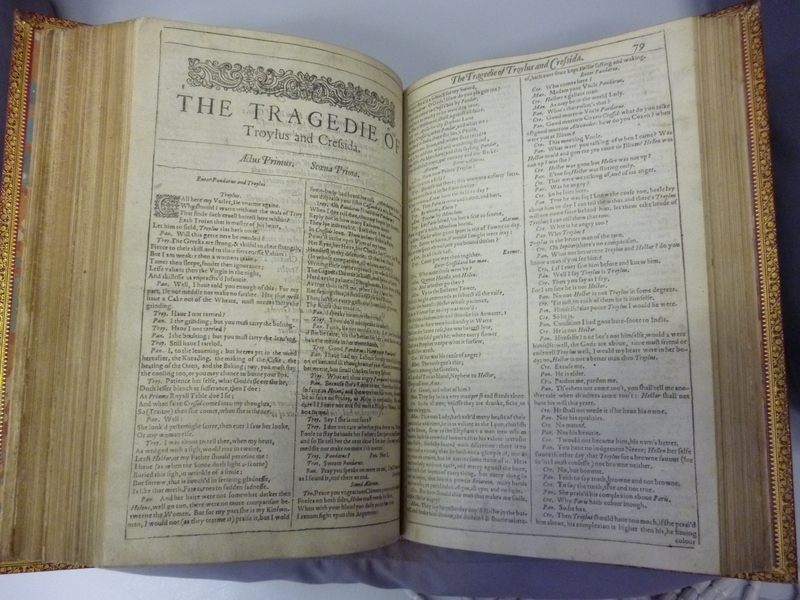 Troilus and Cressida received special mention, the reason being that the text is in the volume but not listed in the table of contents. Early printed books can be exciting and mysterious. The students experienced this; and watching their journey of discovery, the message came across clearly to the facilitating staff too. 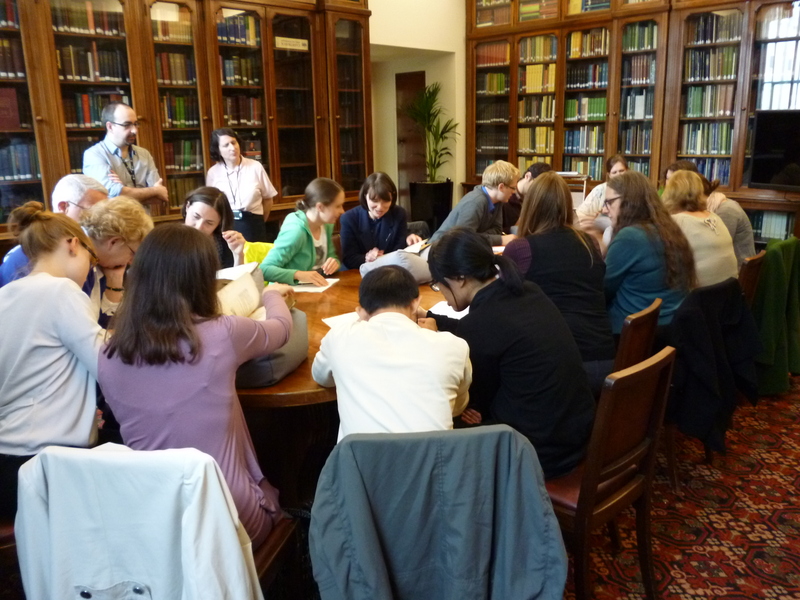 On Monday, 23 September eighteen early career researchers and doctoral students from several colleges of the University of London and from six other Universities came together at Senate House Library for a day’s workshop on material culture. The morning focused on book production in the hand-press period: how books differed from each other even when they left the printer’s shop, owing to such matters as printing variants and differences in the hand-made paper, and how further differences accrued through manuscript additions to texts, ownership, and bindings. All demonstrate the value of the artefact to teach us the book’s history in a way that full-text databases cannot do. Such a workshop can take place only with the help of books. The morning’s session ended with a display of books to show various features: a cheap sixteenth-century volume copiously marked and annotated by an early reader; fifteenth-century tomes with spaces left on the printed pages for initials to be added in manuscript (neglected in one instance and inserted sumptuously in the other); an early, substantial book from 1508 with hand-coloured illustrations; a rare ephemeral early-seventeenth-century school textbook as an example of the low survival rate of such items; books whose producers had attempted to hide their origins; and the 1611 King James Bible, to show how the antiquated black letter typeface made a statement about the work’s authority. After lunch, students paired off to examine more books. Senate House Library is fortunate to hold eleven copies of Francis Bacon’s Historie of the Raigne of King Henry the Seuenth (1622). This publication is notoriously complicated, with printed sheets of two identified issues (STC 1159-60) mixed together. Participants checked the noted variants in their copies to establish that hardly any of the nine were quite the same, owing to differences of spelling (for example, “raigne”/”reigne”; “souldiers”/”souldiours”) and the number of errata in each copy. Differences multiplied as we saw how some copies were bound with other works; how bindings varied from contemporary to twentieth-century and from cheap to decorative; and how owners had added to the individuality of their copies with inscriptions and bookplates. Most distinctively, one twentieth-century Baconian, Henry Seymour, had written a code in his copy to try to show how it indicated Bacon’s authorship of Shakespeare. We finished by looking at the meaning books gain by being part of specific collections: several of the copies had belonged to Sir Edwin Durning-Lawrence (1837-1914), who believed Francis Bacon to be one of England’s greatest men, who collected his works comprehensively, and for whom comprehensiveness extended beyond possessing different translations and editions to owning variants within editions. 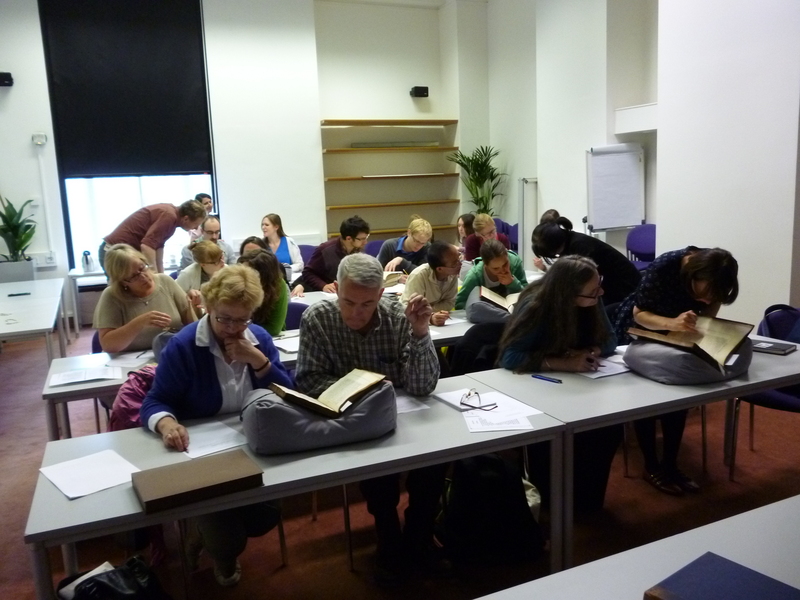 In the final workshop students again paired off to ascertain what they could from seventeenth- and eighteenth-century books from different countries, in different languages and in different formats. They looked at cheapness and expense; at convenience of transportation; at probable use; and at possible laziness – were all the full-page illustrations in a book about machines meant to be grouped together at the front, or had a binder merely not bothered to intersperse them intelligently within the text, or received no instructions for doing so? The day was the second of four workshops devoted to material culture. The workshops are facilitated by the Institute of Historical Research and enabled by AHRC funding. It was a pleasure for Senate House Library to take part. Continuing our irregular series of ‘Beautiful Things’ from the Library’s collections, we return to the Sterling Library and one of its many irreplaceable treasures: a set of engravings of seven of William Blake’s illustrations of the Divine Comedy. 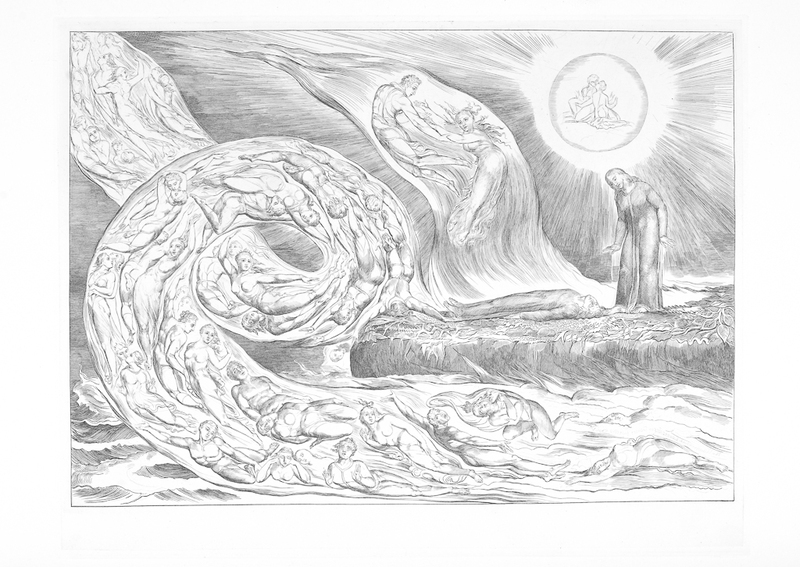 Towards the end of his life, Blake was commissioned by his patron, engraver and painter John Linnell, to produce a set of illustrations of Dante’s masterpiece. Blake began 102 watercolour designs which reached various stages of completion before his death (and can be viewed on The William Blake Archive). 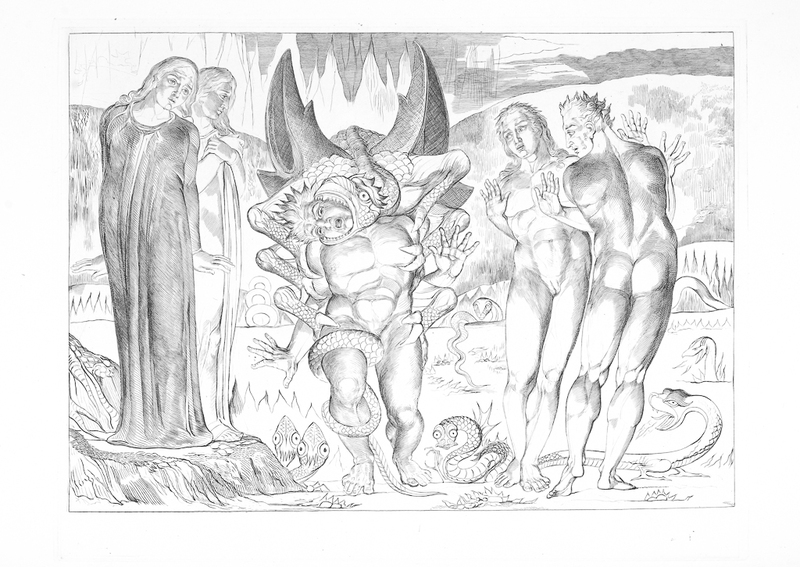 Of these, seven, depicting scenes from the Inferno, were selected to be engraved by Blake. The Sterling Library set is one of five proofs produced for Linnell in 1826, and was in the possession of his family until 1918. As with the watercolours, the plates were unfinished at the time of Blake’s death, but the pure line engravings (a change from Blake’s technique of combining etching and engraving) produced are powerful and elegant, while the prints themselves are of exceptional quality and freshness, having been carefully stored by the Linnells. Linnell did not produce prints of the plates for sale until 1838, and although Blake’s illustrations have since been used in many editions of the text, they were not widely known or used in the nineteenth century. Selections from the watercolours and prints were reproduced in the Savoy in 1896, accompanied by essays by W.B Yeats and in his 1899 bibliography of illustration of the Divine Comedy, Ludwig Volkmann wrote of the illustrations ‘although to-day almost forgotten and never mentioned in any treatise on the pictures to Dante, are to be ranked among the most interesting artistic works suggested by the Comedy’ (Iconografia Dantesca, 1899, p. 134). This is clearly demonstrated by the engravings: the scenes depicted are familiar from Dante’s text, but the interpretation is unique to Blake. 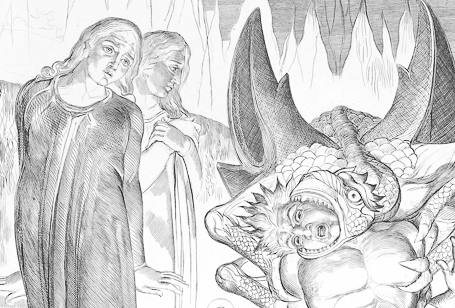 The depiction of Dante and Virgil exemplify Blake’s vision: he does not follow the usual conventions of Dante illustration of attempting to reproduce a likeness of Dante or depicting Virgil as the typical classical poet, as Yeats writes ‘he intended to draw, in the present case, the soul rather than the body of Dante and read “The Divine Comedy” as a vision seen not in the body but out of the body.” (‘Blakes illustrations to the Divine Comedy’ The Savoy, 1896, 4, pp. 38-41). Today, Blake’s illustrations are widely reproduced and easily recognisable but this particular set of prints are to be valued for their quality and provenance and, although unfinished are a beautiful example of Blake’s skill as an illustrator and engraver. Inferno, Canto V: the circle of the lustful and the encounter with Francesca da Rimini. And , as a dead man falling, down I fell. Inferno, canto XXV: circle viii, bolgia vii: thieves: Cianfa, in the form of a reptile attacks and merges with Agnello.